Gustavo Cisneros is currently the Chairman of CISNEROS, one of the largest privately held media, entertainment, telecommunications and consumer products organizations in the world. Additionally, Gustavo Cisneros is the owner of Tropicalia, a high-end, environmentally and socially responsible, tourism real-estate development located in the Dominican Republic. 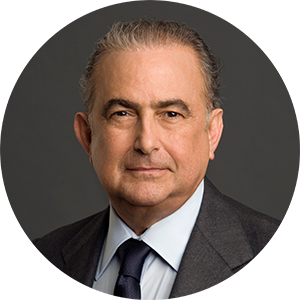 As Chairman and Chief Executive Officer since 1970, Gustavo Cisneros has dedicated himself to both the strategic development of CISNEROS and the overall advancement of the region. His leadership has helped to enhance Latin America’s profile on the global stage, cultivate new industries, increase access to information, and advance technological growth. He has done so in an effort to promote education, the principles of democracy and individual liberty. Today, CISNEROS owns or holds interests in more than 30 companies that serve millions of customers in over 90 countries. Operations range from broadcast television, television production, and telecommunications to travel resorts. Through its diverse businesses and partnerships, the company delivers some of the most recognized brands and highest quality services to the 550 million Spanish- and Portuguese-speaking consumers in the Americas and Europe. Some of the group’s key holdings include Venevisión, the leading television network in Venezuela; Cisneros Media Distribution, a global Spanish-language entertainment company; and Cisneros Studios, a supplier of top-tier telenovelas for North American and world audiences. In addition to his responsibilities related to CISNEROS, Gustavo Cisneros sits on the board of directors of Barrick Gold Corporation, where he is also a member of the International Advisory Board and Compensation Committee as well as chair of its Corporate Governance and Nominating Committee. He is Senior Advisor for RRE Ventures LLC; charter member of the United Nations Information and Communication Technologies (ICT) Task Force; member of the University Council at Rockefeller University, the Board of Overseers at Babson College, and of the Advisory Committee for the David Rockefeller Center for Latin American Studies at Harvard University. Gustavo Cisneros also sits on the Chairman’s International Advisory Council of The Americas Society and the Board of Overseers of the International Center for Economic Growth. In addition, Gustavo Cisneros has been appointed a member of Haiti’s Presidential Advisory Council on Economic Growth and Investment; the Ibero-American Council for Productivity and Competitiveness; the Council for the Atlantic Institute of Government; and the Board of Trustees of the Cardinal Cisneros Foundation. He recently received the Advertising Educational Foundation´s “Lifetime Achievement Award” for his contributions to the entertainment industry and the role of the Fundación Cisneros to improve education in Latin America. In December 2014, he received the Brandon Tartikoff Legacy Award from NATPE (National Association of Television Program Executives). His previous affiliations include some of the world’s most prestigious organizations in the fields of business, education, and international affairs. He has served as Chairman of the Board of the All-American Bottling Corporation and as a board member of the Panama Canal Authority; Panamerican Beverages, Inc.; Pueblo International, LLC; the United Nations Association of the United States; Univision Communications; and the World Economic Forum Board of Governors for the Media, Communications and Entertainment Industries. Gustavo Cisneros has also been a member of the Chase Manhattan Bank International Advisory Committee; the Executive Committee of DirecTV; the Hicks, Muse, Tate & Furst, LLC Latin America Strategy Board of Directors; the Power Corporation of Canada International Advisory Council; the Board of Directors for Queen Sofia Spanish Institute; the Board of Trustees and the Latin American Board at Georgetown University; the Latin America Conservation Council of The Nature Conservancy; and the Chairman’s Council of The Museum of Modern Art. With his wife Patricia Phelps de Cisneros, Gustavo Cisneros established the Fundación Cisneros, a private nonprofit institution committed to improving education in Latin America while increasing international awareness of the region’s contributions in the global cultural arena. The Fundación Cisneros works together with the Corporate Social Responsibility programs of the companies of CISNEROS to fortify communities, promote freedom of speech, encourage economic development, and foster cross-cultural understanding. Gustavo Cisneros received a Bachelor of Science degree in Business Administration from Babson College, in Wellesley, Massachusetts. He recently received an Honorary Doctorate in Humanities from the University of Miami.